Julian Brandt (r.) has got three goals and six assists during Leverkusen's up and down Bundesliga campaign. Bayer Leverkusen are struggling to match their own expectations this season. 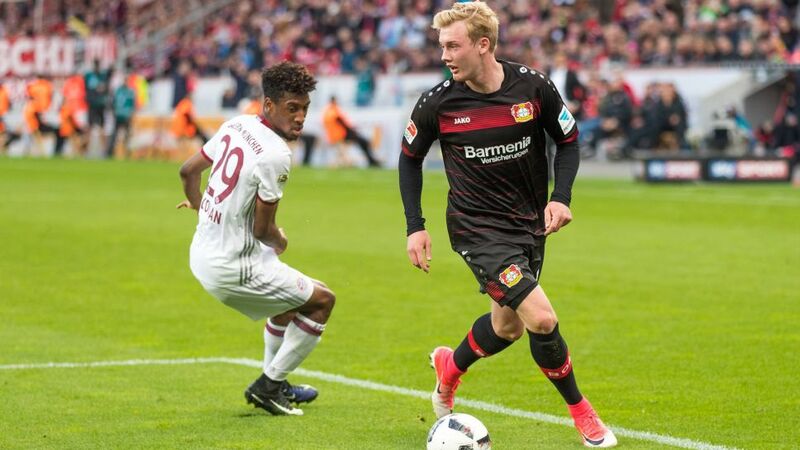 In an exclusive interview with bundesliga.com, their midfield ace Julian Brandt speaks about the reasons for their performances until now, what manager Tayfun Korkut has changed and explains why he does not have any tattoos and why he would not like to spend a thousand euros on a pair of shoes. Want to add Brandt to your Official Fantasy Bundesliiga team? Sign him up here! bundesliga.com: Can you build on last weekend's draw against Bayern Munich? Julian Brandt: Yes. A lot of other teams have failed against Bayern so this result can definitely be seen as positive. I think that a point like this one against Bayern is hugely important because in the run-up to the game hardly anyone expected us to have any chance at all. bundesliga.com: Leverkusen have won only one of their last 10 competitive games – against Darmstadt. Yet the goal for the season was to take on Borussia Dortmund as the number one rivals to Bayern. Why could you not meet this aspiration? Brandt: We have never found any consistency and we have barely been able to win a game that wasn’t so good – and that’s vital if you want to be at the top. We can’t even get the basics right and especially in the first half of the season we left a lot of points behind us. That eats into your self-confidence as you’ve also seen in the Rückrunde. Read: Is Julian Brandt a future Ballon d'Or winner? In the winter, we hoped that we could go on the attack again because everything was so tight in the table. And even now something is possible – admittedly not the Champions League anymore – but [qualifying for] the Europa League is still doable. It would be good if we can at least get to grips with our problems in the last five games. bundesliga.com: Roger Schmidt was replaced by Tayfun Korkut. What has changed since then, apart from that fact that the team is conceding fewer goals but also not scoring as many? Brandt: The fact that our style of play has changed a lot is obvious. They are two different worlds. That we’re conceding fewer goals already is good. If you don’t let in any goals, you also can’t lose. But it’s also true that at the moment we’re not scoring enough. Nevertheless, I believe that something has steadily developed since Tayfun Korkut has been in position – irrespective of the fact that results don’t yet fully reflect this. The manager is giving his all and in my opinion is doing a top job. Now is the time for the team to put this into practice and free themselves from the crisis. The players have to click and we simply have to start scoring again. bundesliga.com: Leverkusen have 36 points at the moment. You’re both four points from a Europa League place and the relegation play-off. Do you and your team mates think more about Europe or of relegation? Brandt: I read a fitting quote from [Werder Bremen forward] Max Kruse about that. Things are going really well at Werder right now. Max nevertheless said you should only think about higher goals - what is still possible - when you have reached the 40-point mark. That fits pretty well for us too. As long as we haven’t reached this 40 point-mark, then we need not think about Europe at all. However, I think it is definitely possible. If we manage to get a win in Freiburg, then we can gradually have our eye on being further up the table again. Brandt: It’s not only when you know about what financial opportunities Freiburg have or do not have that you have to say that they’re having a good season. They really are a good team – especially at home. They’re a very effective team and don’t need a lot of chances. Players like Vincenzo Grifo and Nils Petersen, who’s a good poacher, have great quality. So, I’m expecting a fiercely-contested match, like the home game in Leverkusen when we got a tough 1-1 draw. Watch: See how Brandt's season compared to Franck Ribery ahead of their Matchday 29 meeting. Bundesliga.com: There’s a lot of talk about yourself. Does that burden you or have an influence on your game? Brandt: No. I don’t think my game is suffering as a result. It’s true that a lot has been reported and speculated upon. But that’s part of the business. Most of these reports don’t affect me. In a way, they are a recognition of my performances. What does really bother me is when things are spread around that have absolutely no substance. That was lately more frequently the case. I don’t suffer as much as a result anymore but it’s annoying when you always have to clear things up with family, relatives and friends. In addition, such rumours can stir up unrest among the management and the fans. It’s especially disruptive in the situation we find ourselves in. We definitely could do without it right now. Bundesliga.com: How do you see your development this season? Brandt: I’m never truly satisfied. It can still go better. I’m very critical of myself, even when I’ve maybe had a particularly good game. Then I see that we’re lacking goals at the moment. And I’m now one of the people responsible for scoring goals. So, I’m that little bit more responsible for the fact that we’re not where we would like to be in the table. bundesliga.com: Nonetheless you have created the most clear-cut chances in the league. On the other hand, you are not as strong in the tackle as other players of your quality. Do you rarely go to the weights room? Brandt: On the contrary! I’m often in the weights room. Our fitness coach even advised me to do a bit less because otherwise I could become too bulky. Build, weight, fat content – everything is ideal. Power should also be there. I just have to bring this power to the game more often – to use it better. I have to work on that. bundesliga.com: You have said about yourself – “I’m no mentality monster”. Is that where your problem lies? Brandt: I was actually never the type of player that comes into tackles and constantly puts his bones at risk. That’s certainly not ideal because there are games where that is exactly what is required. I also know that my game sometimes comes across as if I’m lacking a bit of commitment. But that’s absolutely not the case. I prepare myself in the best possible way and always give everything I possibly can for Bayer 04. And I’m convinced that you can show your mentality as a player not only through your body language but also with your head. Everyone is different. Nevertheless, it is clear to me that I have to work hard on myself in this regard. bundesliga.com: You seem to be very reflective and self-critical. In the glitzy world of football, how do you remain – in the best sense – normal? Brandt: As I said, everyone is different. Some like this glamorous world more and I find that OK too. But it is not necessarily my world. I don’t have any tattoos and I don’t need any thick watches, instead I’m a proven family person who always finds the necessary support within the family. I believe that comes across quite well for many people. In this way, I get twice as much: I don’t bow to anyone but people like me anyway, even because of that. What’s crucial though is how you are in the public eye. If you’re draped in gold from top to bottom, have an arrogant manner and speak to nobody, then it’s understandable if people don’t like you. But if you go up to them and are friendly, then I see no problem if you allow yourself a nice car or whatever else. That’s what most people would probably do if they had the chance. bundesliga.com: What do you treat yourself to for example? Brandt: I also like to drive a nice car. Above all though, I value a nice apartment. When I’m at home, I want to feel good. Only then can I also produce my best performance. In terms of an apartment, I’m not stingy. On the other hand, I wouldn’t buy shoes or trousers for a thousand euro. That’s just not the way I am. And probably even today I’d still get something on the back of the head from my parents if I burned my money like that. Probably after three months the clothes would be lying somewhere deep in the back of the wardrobe anyway. Click here for more Bayer Leverkusen news!